Mobile health may seem like old news, but smartphone use for health and fitness is still growing fast in 2019. There are more mobile device users and mHealth apps than ever before. Most smartphones owners have downloaded an mHealth app and nearly every physician brings a smartphone to work. In this world of healthcare on-the-go, here are 11 mHealth statistics that will surprise you. 2. There are now 318,000 mHealth apps available in major app stores. That number has nearly doubled since 2015 driven by increased smartphone adoption and ongoing heavy investment in the digital health market. 3. Over 60 percent of people have downloaded an mHealth app. Yes, that is a big number. These fall into two major categories with wellness being much more common (85 percent) than medical (15 percent). 4. Most smartphone users have used their device to gather health-related information. A 2015 Pew Research Center study cited that number at 62 percent, making mHealth a more common smartphone activity than online banking (57 percent), job searches (42 percent) or accessing school work or educational content (30 percent). 5. 90 percent of physicians already use smartphones at work, where they use it to access electronic health records, communicate with their team, reference information, or manage their schedule. New apps and services make it increasingly possible to use smartphones as a valuable clinical tool that frees up time to spend with patients. 6. Two-thirds of the largest US hospitals offer mobile health apps. While at first glance this sounds impressive, Accenture finds that providers pursuing mobile patient engagement are failing because apps offer poor user experience and functionality. Proprietary patient-centered apps have the potential to better align functionality with patient needs. 7. 43 percent of millennials prefer to access patient portals from their smartphone. Based on a 2014 Xerox study, this number is surely higher in 2019. Experts hope mobile access might boost actual portal use, which lingers around 15 percent despite nearly 90 percent of providers offering patient portals. 8. 74 percent of patients say using mobile apps wearables and other mHealth tools helps them cope with and manage their conditions, according to the Boston Technology Corporation. 9. 85 percent of health insurance companies think mHealth creates value. Surveys show that companies in the market assume patients are willing to share their health data for a cheaper plan, for health recommendations, or for research purposes. 10. 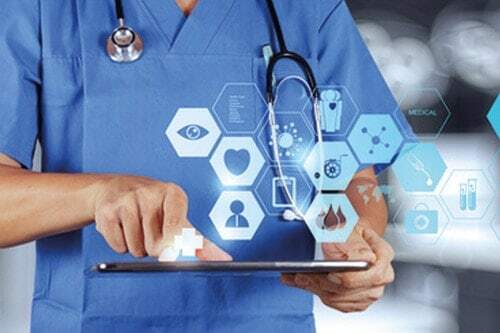 The biggest cost saving benefit from mHealth apps will be in reducing hospital costs by decreasing readmission rates and length of stay, and by assisting with patient compliance to medication plans. That’s according to the majority of respondents (60 percent) in a Research2Guidance report. 11. The global mHealth app market is growing fast and expected to reach $111 billion by 2025. 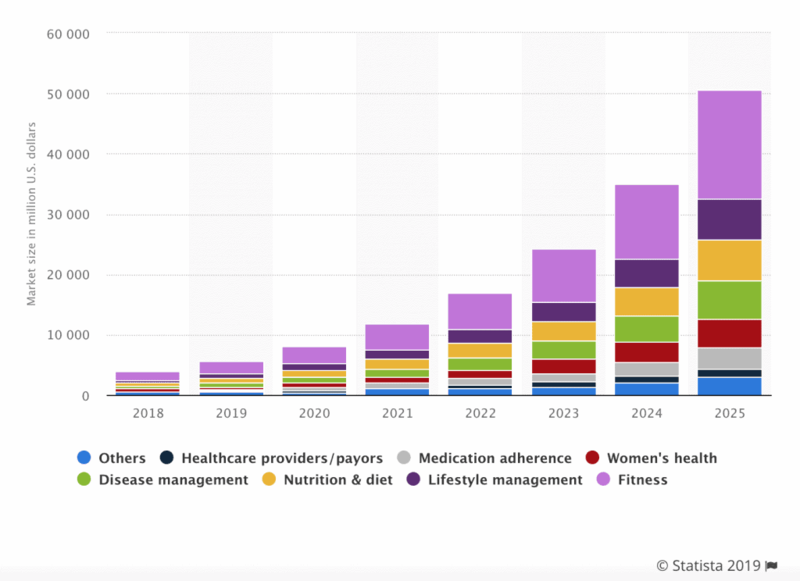 Fitness accounts for the largest share of the US mHealth app market, which is expected to grow to $50 billion by 2025.